Since I’ve been Home, there have not been enough words. I’ve felt strangely and entirely inarticulate. Perhaps it is because the journey I’ve been on can’t be captured in alphabet and typeface, and the thought of trying to articulate it leaves me awestruck, and so I do not try. But I suspect that – in reality – the awestruck feeling has come from there being too many words around me now. After three years of skating by on just enough Dutch/ Italian/ Albanian/ French/ Serbian/ Arabic; and three years of minimising my own language to the most minimal, easy-to-understand, please-don’t-let-me-be-misunderstood English, returning back home has proved a cacophony of words. I’ve had three years of rarely understanding the chatter in the street, never understanding the radio, being in a cocoon world where the dramas of a stranger on the bus shouting into their mobile phone do not register, being insulated from the overwhelming reality that words provide. Sinking back into a country where I understand everything has been like a roar in my ears. So I have not been reading, and I have not been writing. I have barely picked up a book: in four months, I have struggled through a light fiction, and devoured only one book of ferociously beautiful essays. I am reading poetry; short, sharp lines where there can be little confusion. I am luxuriating in wads of weekend newspapers, which sometimes take me a week to finish. This website has been left to languish; and I have written only a few lines in my journal, a handful of letters, and hardly any emails. And instead of reading, or writing, I have been: walking, sun-soaking, strawberry-picking, wine-drinking. I have been going for long drives in the country and marvelling at the fact that I can see the horizon, and undulating hills, and spring lambs, and swathes of forest in the distance. I have been sitting in my best friend’s kitchen, at her table, drinking pots of tea and laughing. I have been training my new puppy, and having months of my sleep interrupted as I listen out for his steady breathing like I imagine a parent does with a new-born. I have been eating cheese, and berries, and big brunches. I have been doing yoga most days. I have completed hundreds of sun salutes, and the moments I have spent in downward facing dog pose have gradually accumulated into hours. I have been sorting photos into albums, and papers into boxes, and all those things that have been in storage for three years. I have time-whiled in cafes and wine bars. I have been on boats surrounded by dolphins and seals and shearwaters. 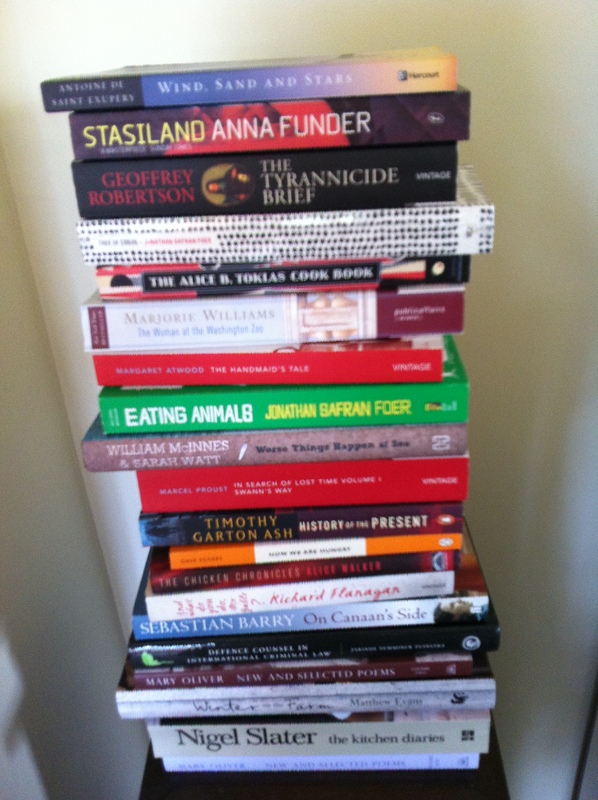 With nearly six months of not working, I had expected to greedily read books and write tomes. Instead, I have busied myself in the space between words. And this space – this grace – has been a gift. I have felt guilty, and a little stupid, but ultimately the languid way of being without the pressure of striking books off a to-read list, or creating pieces of prose, has suited me well. I start a PhD in six weeks’ time. The grace between words is nearly over. And yet, so often I find myself grateful for words. This week one friend sent me both a posted letter, and this, via email: I imagine myself in a long-distant land of being a mother to teenage sons, and stuffing copies of this into their wallets/ lunch boxes/ car glove-boxes, in an attempt to convince them to bring home girls who know how to shelve bookcases. Another friend sent me – from the Netherlands – a book which made me giddy with knowing how much she cares about me, and how deeply she knows me. A third friend sent an email that dripped love. This festive season, I have received some of the loveliest Christmas cards I can imagine. Reading my mother’s journals and letters from many years before I was born has been humbling, hilarious, and the most precious gift. These words, these words – I can’t now imagine my life without these words. So sometimes, perhaps, the breaths between the sentences – the full-stops that punctuate our lives and give us the rest we need – are as necessary as the words themselves. Sometimes the absence of something makes its presence even more special. Sometimes the grace between words allows us to be grateful for the good words we do meet. In the narratives of our lives, I’m glad for the words, and I am glad for the punctuation of space. This entry was posted in Uncategorized by Sophie & thelittlejoys. Bookmark the permalink.